International departure taxes of $217 plus current fuel surcharges of $300 are included (subject to change). We arrive mid-afternoon at Okecie International Airport, Warsaw. After clearing arrival formalities, we board our motor coach and begin our brief orientation tour of Warsaw. Time permitting, we will drive through the Old Town, where each historic building has been painstaking and lovingly reconstructed after the destruction during WWII. We drive by St. Jacob’s Church where Jesus said to Blessed Sister Faustina: “It’s here I called you, and not elsewhere.” Early evening check-in at our hotel for dinner and overnight. This morning we celebrate Mass at St. John’s Cathedral, Warsaw’s oldest architectural monument, dating back to 1338 and rebuilt from ruins of WWII. Following Mass, we depart to Niapokalanow, home of the monastery built by St. Maximilian Kolbe. We travel to Glogowiec, the birthplace of Blessed Sister Faustina where Jesus appeared to her in l931 and requested she paint the picture of His Divine Mercy. We return to our hotel for an overnight stay. Tonight, we have an opportunity to attend one of Warsaw’s cultural events. After breakfast, we board our motor coach for a two-hour ride to Czestochowa. We make our way to the monastery complex of Jasna Gora to visit the Marian Shrine. Jasna Gora consists of a Gothic/Baroque church, a Baroque monastery, and fortress. This is where the miraculous picture of Our Lady of Czestochowa (Black Madonna) has been preserved. We tour this shrine and celebrate Mass. There will be time for private devotion, and to walk around the town. We continue to Krakow for dinner and overnight. Day 5 - KRAKOW - "THE POLISH ROME"
This morning we celebrate Mass at the Church of St. Florian, where John Paul II served as a curate, and where he lived while university chaplain. Afterwards, we meet our guide and begin our sightseeing tour. Our first stop is the courtyard of 16th century Royal Castle, and Wawel Cathedral, where generations of Polish Kings are buried. We take a walking tour of the Old Town, visiting some of the treasures of this wonderful old city. We view the Town Hall Tower and the Cloth Hall, located on the same site since the 14th century, the 15th century Collegium Maius in the oldest university area and St. Mary's Church. Here we enjoy the ancient tradition of the "Hejnal" or bugle call from the Tower, which warned residents of the coming of an enemy. This afternoon, we ride to Wieliczka, famous for its salt mine, which has been in operation for over 700 years. We visit the upper levels of the mine, where we view chapels with altar pieces and statutes all hand carved by devout Polish miners. Return to Krakow for dinner and overnight. After breakfast we depart Krakow and travel to Wadowice, the birthplace of Pope John Paul II. En route we pass by the Kalwaria Zebrzydowska Benedictine Monastery where the Holy Father often prayed and walked the Stations of the Cross. In Wadowice, we celebrate Mass in the parish church where the Holy Father was baptized. Afterwards, we visit the museum in his small family home. We continue to the infamous Auschwitz Concentration Camp with its Martyrdom Museum. Pope John Paul II visited the cell of St. Maximilian Kolbe at Auschwitz in June 1979 on his first visit to Poland after becoming Pope. Finally, on return, we visit the newly built Basilica of the Divine Mercy, the home of St. Sister Faustina. We see the convent and visit with the Sisters there. Dinner and overnight at the hotel. After breakfast, we visit Kazimierz, an old Jewish city with medieval roots which has preserved the original town plan. We then visit Wawel Hill, which is the old seat of Polish kings also dating back to medieval times. It is topped with a Gothic and Renaissance castle with a courtyard. We pass the monument commemorating the Polish and American hero, Kosiuszko. In the afternoon, those who wish may return to the Divine Mercy Shrine for personal devotion and our closing Mass. Return to our hotel for dinner and overnight. We depart Krakow for our flight to Munich. Our day in Munich is free for personal adventure. Later, we check in to our hotel for dinner and overnight. This morning we are met by our local guide who leads us through the exciting Bavarian capital. We pass the Olympic village and stadium, along the Leopoldstrassen, with the Triumphal Arch, and Hall of Generals. We also see the Theatiner Church and Residence Palace. We visit to the Nymphenburg Palace and stop to see the famous Glockenspiel at the new Gothic City Hall to complete our tour. We celebrate Mass at the “Frauenkirche”, the Cathedral of Munich. Dinner and overnight at our hotel. This morning, following Mass at a local parish church, we enjoy the scenic drive to Oberammergau. We arrive in the famous Passion Play village, where we transfer to our accommodations. Following lunch on our own, we are free to visit the Oberammergau Museum or simply walk among the many craft shops. We then head off to the Theater. “A play about death and life, promised at the moment of a fatal threat”-these are the opening words of the story of the Oberammergau Passion Play in 1633. In the middle of the Thirty Years War, after months of the suffering and dying resulting from the plague, the people of Oberammergau vowed to perform “The play of the passion, death and rising of our Lord Jesus Christ” every ten years. At Whitsun 1634 they kept their promise for the first time, on a stage which they had set up in the cemetery, over the graves of those who had died of the plague. 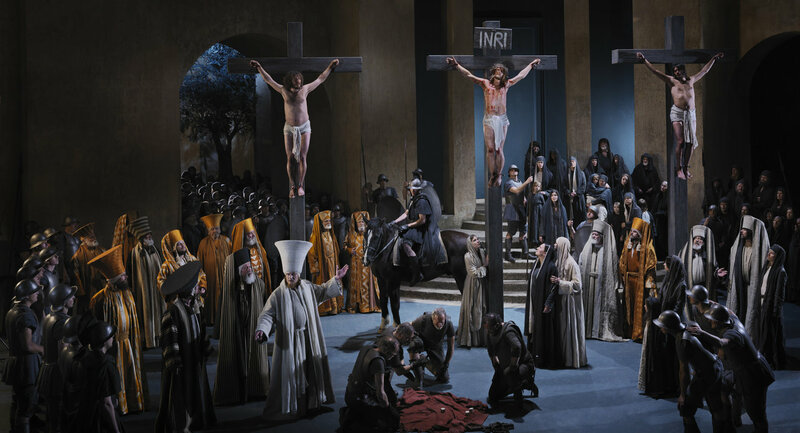 In 2020 Oberammergau, for the 42nd time, are putting on the play that has been carried on over the centuries in a unique continuity. The play illustrates the story of Christ’s Passion, beginning with the entry into Jerusalem and ending with the resurrection. The structure of the play consists of living pictures from the Old Testament and acted scenes from the New Testament. The Play employs a large choir and orchestra. Our performance runs 2:30 to 5:00 PM, with 3-hour break to enjoy our included dinner, then the performance resumes 8:00 to 10:30PM. Overnight at our accommodations. Today we depart Oberammergau and make our way to the Munich Airport where we head home with memories for a lifetime.